Gen X and Not Liking Hillary Clinton – Are We Really Just Sexist? Recently, Gen X commentator Hana Schank took to the pages of Salon.com to opine that the reason Generation X doesn’t “like” Hillary Clinton is that we are all suffering from unconscious sexism. If she was a man, says Schank, she “would be the front-runner hands-down”. Also a Gen X woman in my 40s, with a long career in business, including running my own consultancy, I am no stranger to the entrenched, often-subtle sexism that still pervades the business world. In no way would I ever argue that it doesn’t exist, or it isn’t as bad as Schank makes out. She is right on the money with her comments in that area. I think, however, she has misread the current political sentiment. If this were a normal election, in which similarly-funded candidates with similarly focus-grouped platforms were trading similarly-scripted talking points, pointing at sexism might be valid. 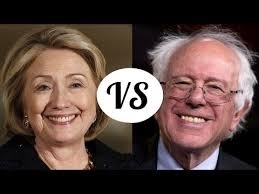 However, when it comes to Bernie Sanders vs Hillary Clinton, the differences between them are far more profound than the shape of their underpants. On both sides of the political divide, the primaries are a dramatic contest between corporate-sponsored, immaculately-suited, morally-compromised party politicians and the iconoclastic maverick outsider who is not beholden to corporate interests and is willing to say what the people have been thinking for a long time – this system is rotten to the core, and we need to break the grip of corporations on the US political system. The people are fed up. The chickens are coming home to roost. The largest pool of voters is those who have no affiliation with either Republicans or Democrats – the independent voters. They don’t trust either political party, or any PR-driven politicians. They cannot be counted on to loyally vote for whomever the party puts up as the Presidential candidate. In fact, a significant proportion if those independent voters, is they are not offered the chance to vote for Bernie Sanders as President, would vote for Donald Trump before they voted for Hillary Clinton. Despite almost blanket advocacy in the mainstream media of Clinton as the only electable candidate, the reality of the political landscape is that she can’t win against Trump, while Sanders can. Polling has been relentless, and it is time for Clinton’s supporters to face the cold, hard facts. When a candidate has taken millions from corporations, an electorate suspicious of corporate influence will look for an alternative candidate. In previous elections, there hasn’t been one. In this election, there is one on the Republican side, AND one on the Democrat side. And they are both, against all of the pundits’ predictions, going from strength to strength. We’re fed up, Hana, and we’re not going to take it any more. While I personally would never vote for Donald Trump, if I can’t vote for Bernie, I certainly won’t be voting for any bought-and-paid-for corporate shill, no matter what shape their underpants might be. And as far as I can see, that’s exactly what Clinton is. That’s not sexism; if Bill were running instead not Hillary, I would feel exactly the same way. It would be lovely if Bernie Sanders was a woman. And yes, it is sexism that created the situation where we don’t have a woman with the kind of track record in politics that Bernie has. However, for me it comes down to this – nobody gets to choose their gender, but everyone gets to choose whether they sell out their principles for corporate donations. It’s not Bernie’s fault that he’s a man, but it is certainly Hillary’s fault that she is completely compromised by her relationship with corporations. I just pray that Bernie wins the Democratic nomination, and takes Elizabeth Warren with him to the White House. Bernie Sanders, Generation X, Hillary Clinton, sexism, u.s. Politics, U.S.A.